Williams %R is an indicator similar to the Stochastic Oscillator, but calculated a bit differently. Developed by Larry Williams the indicator reflects the difference between the high, low and the current price over a look back period. Generally that look back period is 14, which could based on any time frame, such as 1-minute, 5-minute, or hourly price bars, etc. The indicator moves between 0 and -100. A reading between 0 and -20 shows the price is near its high over the look back period. A reading between -80 and -100 shows the price is near its low over the look back period. Commonly these areas are called “overbought” (0 to -20) or “oversold” (-80 to -100), although these labels can be deceiving. As indicated, all these levels really mean is the current price is trading near the high of the look back or near the low. So just because something is overbought doesn’t mean you necessarily want to sell it, or just because something is oversold that you necessarily want to buy it. Prices can remain in overbought or oversold territory for a long time, especially during a strong uptrend or downtrend respectively. One way to use the indicator is to watch for overbought levels and then a move back below the mid-line (-50). This provides a sell signal. An oversold level and then a move back above the mid-line (-50) provides a buy signal. In figure 1 the buy and sell signals are marked with vertical lines–green for buy and red for sell. During strong moves and the indicator worked better. Since it will always lag behind the price, when the price movements are large, by the time the trader gets the signal there is still room to get in and make a profit. During quiet conditions there are likely to be more false signals, where a buy or sell signal is given but the price doesn’t follow through in that direction. Instead of using these as trade signals though, they are likely better used as just an indication that the trend has shifted. Using price analysis can also help cut down on the number of false signals. If there is a strong uptrend on the chart, then only trade the buy signals. If there is a strong downtrend on the chart, only trade the sell signals (see: When a Trend is Trustworthy and When It Isn’t). The Williams %R can also be used to gauge momentum. During a downtrend you want to see the price continually reach below -80 to confirm that the downtrend has strength. If the price stops reaching -80 or below, then it signals that the downtrend is losing strength and an upward reversal may be coming. 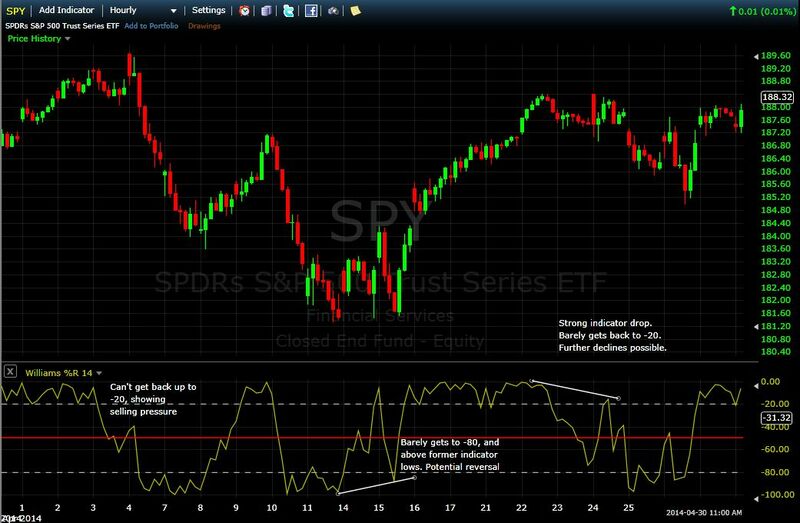 During an uptrend you want to see the indicator move above -20 on a regular basis. If it can’t do it, it shows the uptrend is losing strength. Figure 2 shows a few examples of this method. Starting from left to right, we see a strong drop in the price and indicator, and a small rally on the indicator can’t get back to -20, which helps confirm momentum is strong down. In the middle example, the indicator moves from oversold to overbought (price is in a small range) but when the indictor moves back down it barely gets -80 (higher than prior indicator lows), showing some underlying strength. This warned that the price could pop higher, which it did. On the right we have a strong uptrend and indicator remains overbought for some time. It then falls below -50 and on the rally back just barely makes it to -20. This high on the indicator was significantly lower than the prior highs, indicating the trend had lost some steam. From there the price drifted lower. While it is possible to use this indicator for trade signals, it’s not recommended. 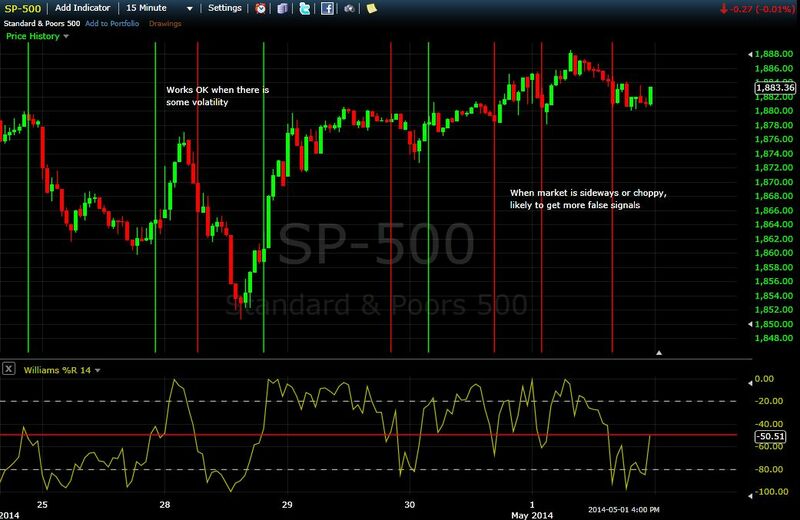 Rather use the indicator for confirming other analysis you are doing and to spot underlying weakness or strength. Adjust the parameters of the indicator, such as giving it a shorter or longer look back period, to align it with your strategies and analysis methods. If you do decide to use the indicator for trade signals, use it during trends and when price is moving strongly. You may also opt to use slightly different levels, or techniques for entering and exiting trades than the standard applications mentioned above.